Some of the eggs, which originated from the Netherlands, were also found in France, the country's agricultural ministry said. The UK's Food Standards Agency say the risk to the public is very low. The agency is "urgently investigating" the issue, but to the best of their knowledge, the affected products are no longer on shelves. It says there is no need for people in Britain to avoid eating eggs and any potential exposure is unlikely to harm. The revelations come after the supermarket chain Aldi withdrew all eggs from sale in its stores in Germany last week. Tests had shown the chemical fipronil, which can harm kidneys, liver and thyroid glands, was found in the eggs. It is feared that farmers in the Netherlands may now need to cull millions of birds as it seeks to eradicate traces of the insecticide from production, according to LTO, a Dutch farming organisation. On its website, the FSA said: "Our risk assessment, based on all the information available, indicates that as part of a normal healthy diet this low level of potential exposure is unlikely to be a risk to public health and there is no need for consumers to be concerned. "Our advice is that there is no need for people to change the way they consume or cook eggs or products containing eggs." Fipronil can treat lice and ticks in chickens, but should not be used on food-producing animals because of its toxicity. 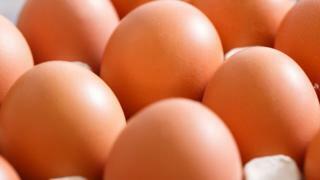 Shops in Belgium, the Netherlands and Germany, have removed the eggs from sale as a precaution. About 180 poultry farms in the Netherlands have also been temporarily shut in recent days while investigations are held. The FSA says approximately 21,000 eggs were distributed to the UK from implicated farms in the Netherlands between March and June of this year. But it says this is a very small proportion of the 1.8 billion eggs the UK imports each year. Around 85% of eggs consumed in Britain are home-produced.